Santa María de Ventosa is a building capable of making us doubt the usual concept of a church. Although its exterior is beautiful but conventional, what it holds inside is truly extraordinary: placed on either sides of the main nave lies a stone frieze that is a whole collection of medieval religious sculpture, a row of works of art that can take us hours to enjoy and decipher. 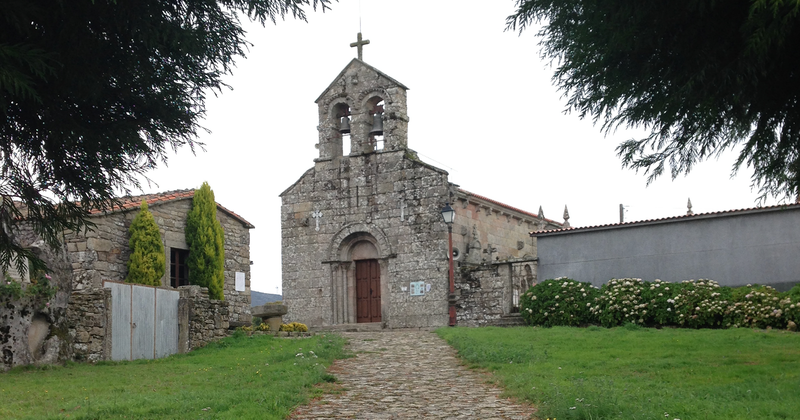 Ventosa is located in the municipality of Agolada, in the interior of Pontevedra. It is easy to think of this province as an exclusively maritime territory, due to the much better known Rias Baixas. But the mountainous area that borders with Lugo, an area of ​​great beauty and landscape diversity, is also part of this province. The lands of the Deza, in which this monument is located, and those of Montes or Tabeirós are a paradise of undulating roads, rounded mountains and green meadows. At the top of one of these hills is the church of Ventosa. The building has adapted to the times and circumstances for 800 years, and this is the reason for the accumulation of medieval sculptures placed against the interior walls: they were part of the old Romanesque building and later works. Most of the building, originally from the twelfth century, was modified in the nineteenth century, but the sculptural pieces were not discarded and were placed on the interior walls of the single nave, creating a very curious effect. The central element of this particular museum is the tomb of Abbot Lope de Ventosa, from the fourteenth century, framed in an arch of clear Romanesque inspiration that could well be the entrance to any Galician temple of the time. The figure of the Abbot is surrounded by angels and inside the arch the scene of the death of Jesus Christ was delicately painted, which shows the importance that Lope de Ventosa must have had in his time. Around the opposite wall, even covering some beautiful Renaissance paintings, the neighbours of Ventosa placed sculptures with works of the nineteenth century showing biblical scenes that came from a baldachin dismantled for lack of space. There is a spectacular Birth and Adoration of the Wise Men; Adam and Eve, tempted by the snake; the death of Abraham… Several centuries of art are condensed in this two facing walls, and the explanatory panels help to understand who is who in such a large iconographic catalogue. The polychromy can still be observed in every figure; which makes us wonder how they would have looked in its time of splendour. The visit can be completed by going back to the village of Agolada to walk through the curious Pendellos, an area consisting of stone and wood constructions that host the local market since the eighteenth century. Well preserved and usually solitary, walking through its streets, intact for 300 years, transports the traveller back in time.